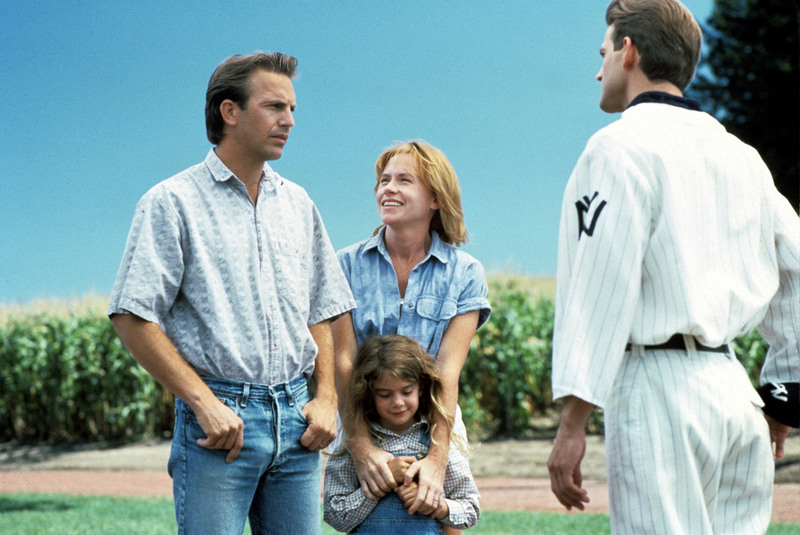 A lyrical fable about the meaning of life, Field Of Dreams embraces a loveable eccentricity as it meanders down the path of answering the big questions. Mixing the rich mythologies of baseball and the cultural earthquake of the 1960s, the film celebrates life as the sum total of poignant outside influences and deeply personal decisions. Ray Kinsella (Kevin Costner) never properly resolved his relationship with his late father John, a bit-part minor league baseball player. Ray experienced the turbulent 1960s, married Annie (Amy Madigan), and finally settled down as a corn farmer in Iowa. Walking his fields one day, Ray hears a Voice repeatedly telling him "if you build it, he will come". After seeing a vision, Ray goes ahead and flattens a patch of his corn field, and builds a baseball diamond, complete with floodlights. Soon, Shoeless Joe Jackson, John Kinsella's hero, appears from the wall of corn surrounding the diamond; he and Ray talk, and Ray pitches to Jackson for some practice hitting. Other members of the 1919 Black Sox scandal soon start joining Jackson on the field, but only Ray, Annie and their daughter Karin can see them. There are more instructions from The Voice, and these lead Ray to take a road trip and connect with Terence Mann (James Earl Jones), a once influential 1960s author now reduced to a crusty, angry and reclusive curmudgeon; and to Archibald "Moonlight" Graham (Burt Lancaster), a baseball player from the 1920s, who fielded half an inning in one game and never had an at-bat. Graham went on to become a well-respected doctor, and although he died in the early 1970s, Graham first appears to Ray in his elderly "Doc" persona, and then as a youthful and eager ball player. Congregating back at the baseball field on Ray's farm, now busy with many players from bygone eras, the young Archie Graham gets a chance to fulfill his ambition of one major league at-bat before his ball career gets interrupted again; and Terence receives an invitation to rediscover his magic in the corn field. There is one more visitor to Ray's field of dreams, and a final lesson about appreciating what life has to offer. In one of Kevin Costner's defining roles, he plays Ray Kinsella as a man embarking on an incredible yet needed journey, guided by forces that he does not understand to connect the dots of his life. Costner conveys anchored bewilderment to perfection. Amy Madigan defines the spunky and fully supportive wife, and shines in the one scene at the school PTA meeting where she demonstrates what she contributed to Ray's life. James Earl Jones and Burt Lancaster appear to have enormous but controlled fun lending their domineering authority to the roles of Terence Man and Doc "Moonlight" Graham. 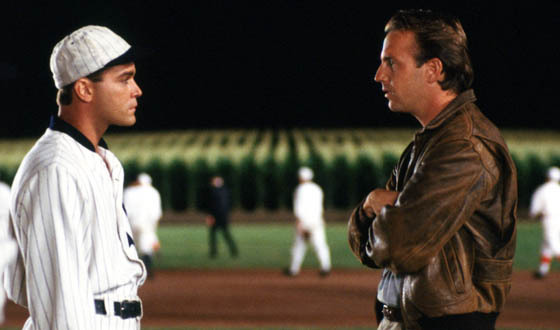 There are many hidden and interweaving meanings and themes running through Field Of Dreams. Most apparent is the value of listening to the inner voice when making decisions, although in this case instinct is crystallized as a clear outer voice. Ray does not fully understand where The Voice will lead him, but he trusts the instructions and never regrets doing so. Celebrating life as the accumulation of past legacies and key individual decisions is the overall theme of the movie. Baseball played a large part in Ray's heritage and childhood; the 1960s defined who he was, and led him to his wife; she in turn influenced his decision to relocate to a farm in Iowa. These elements are mixed in a rich broth, represented by Joe Jackson and Terence Mann, to awaken Ray to the treasure of his life's accomplishments. The character of Moonlight Graham serves to reconnect Ray with his father's achievements, as well as his own lack of success on the baseball diamond: just like John and Ray Kinsella, Graham never made it in the Big Leagues; but Graham vividly demonstrates to Ray the value of contributions made by failed baseball players. There indeed is a rich purpose to the life of those not quite good enough to hit, pitch or catch a baseball. Phil Alden Robinson directed his own screenplay, adapted from W.P. Kinsella's book Shoeless Joe. Robinson allows the magic to flow with a tinge of humour and a shading of pathos, the story never pretending to be anchored in anything other than the enchantment of the soul. Field Of Dreams succeeds due to its unadulterated joy of the incredible, the film a surrender to a pleasant self-aware dream. From the early moments of The Voice talking to Ray to the long series of ghosts starring in time-shifted events, Field Of Dreams takes place in an alternate reality where the fantastic is acceptable, and a diverse set of miracles work together towards a common, human-centred and very down-to-earth conclusion. Sometimes, the spirits just enjoy the freedom of providing guidance using their own curious methods.